Neoantigens are mutated peptides that are expressed by tumor cells, but not by normal tissue. As a result, they can be recognized as foreign antigens by cells of the immune system — making them promising targets for personalized cancer immunotherapies such as vaccines and adoptive cell therapies. However, because neoantigens can arise from any gene in the genome, neoantigen identification requires exome and transcriptome sequencing. ACE ImmunoID™, together with NeoantigenID™, helps inform neoantigen selection by integrating exome and transcriptome data into useful analytics, as well as providing tumor mutational burden (TMB) and neoantigen load. 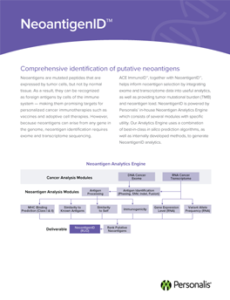 NeoantigenID is powered by Personalis’ in-house Neoantigen Analytics Engine which consists of several modules with specific utility. Our Analytics Engine uses a combination of best-in-class in silico prediction algorithms, as well as internally developed methods, to generate NeoantigenID analytics.